We can’t help our homeless without Volunteers! We need you to serve in order to keep our shelters open. You can find our online volunteer form here: Online Volunteer Registration Form. We have an online calendar to make signing up easier. Signup.com Code Purple Sussex County Online Calendar.We have “ON CALL” days from November 1st to December 31st. We will call code purple when the overnight lows are 32 degrees and below. If you sign up on an “ON CALL” night, know that if the overnight lows are not 32 degrees and below these spots will be deleted. You will receive an email but please keep on eye out for our emails and posts. Please be pro-active and sign up for the days you know you can volunteer. It is critical to know who can volunteer on these nights as the weather is very unpredictable. Code Purple Sussex County will be open every night from January 1st, 2017 to March 12th, 2017 to eliminate the weather variable. After March 12th, 2017 we will return to calling Code Purple for 32 degrees and below. Please sign up to do In-Take, bring dinner, or stay overnight at one of our shelters. Share the news with your church, civic organization, and with your friends and family. We really need overnight volunteers. Avenue UMC, Shepherd’s Office, Seaford (location to be announced), Gateway Fellowship slots are ready to be filled! Please sign up today! Any questions please call the hotline at (302) 519-0024 or email us at sussexcountycodepurple@gmail.com. 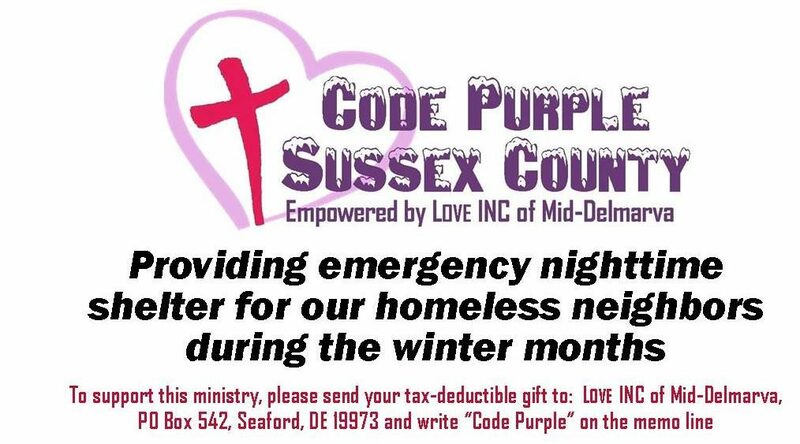 Avenue UMC, Milford DE will open as a Code Purple Sussex County Shelter this season! We are pleased to announce that Avenue United Methodist Church in Milford will open as a Code Purple Shelter. They are located at 20 N Church Street, Milford, DE. When the low is forecasted to be at or below 32° the sanctuary opens for emergency shelter for the homeless. Advance notice will be given when this shelter is in use. This shelter will be for men ONLY. In-take from 7pm to 9pm, dinner will be served at 7:30pm. Guests will need to leave by 7am. Any further questions please contact Nikki Gonzalez at 302-519-0024. We want to thank the Avenue UMC board for voting to join in the efforts to save lives of our homeless during the winter months. If you wish to volunteer with this effort please attend our training meeting on Wednesday, November 9th at 7pm. October 18, 2016: From the Code Purple Sussex County Board of Directors Code Purple Sussex County is pleased to announce our 2016/2017 Leadership for Code Purple and the addition of several new churches in our community. Should you like to volunteer at Code Purple Sussex County, please contact one of our Board of Directors Directly or call our hotline 302-519-0024 or email: sussexcountycodepurple@gmail.com. If your Church is interested in joining the Code Purple Sussex County Network, please contact us to get set up for be a Code Purple site. Sussex County Homeless Coalition has created a MOU (Memorandum of Understanding) available for all Code Purple sites, for best practices and in line with our strategic plan to combat homelessness in Sussex County. Please be sure you are signed up with the coalition for collaboration and connection to resources and other community partners. If your church is interested in becoming a Code Purple site, Email loveincofmiddelmarva@yahoo.com for a copy of the MOU.